When it comes to the depth of your tire tread, the science is in: Tread depth is crucial to driving safety, especially in wet, slushy, and snowy road conditions. Tire grooves, sipes, shoulders and other elements of the tire tread can manage these weather conditions only with sufficient tread depth. Run the tread down to, or below the minimum tread depth, and even the very best tread design can be overwhelmed by the road conditions –resulting in a loss of traction. Keeping track of your tire tread depth is important to your driving safety – so how do you check tires’ tread depth? 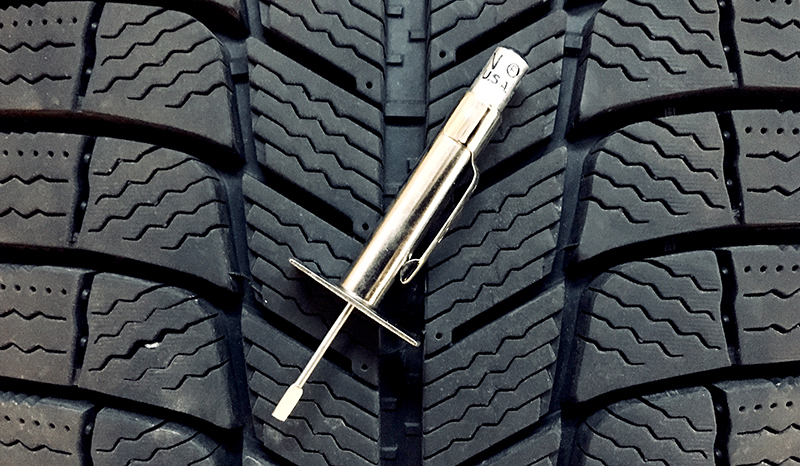 For the most accurate results, you'll want to use a tire tread gauge. 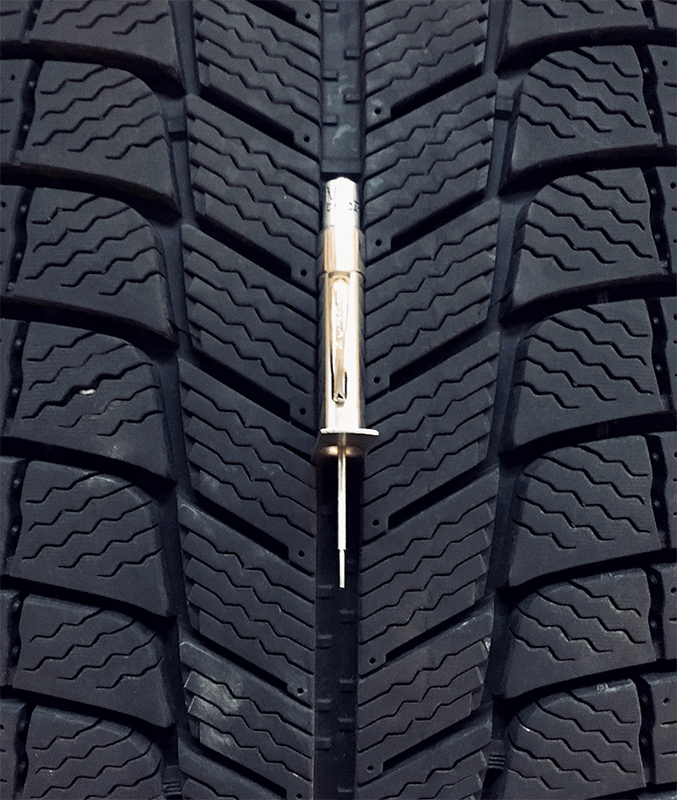 Before using the tire tread gauge, you'll need to identify the tire's circumferential grooves. In layman's terms, these are the primary channels (centrally located on the tread) that run all the way around the tire. These grooves will be our main tread depth measurement points. Begin with the gauge in the collapsed, pre-measurement position, as shown in the tread gauge image above. 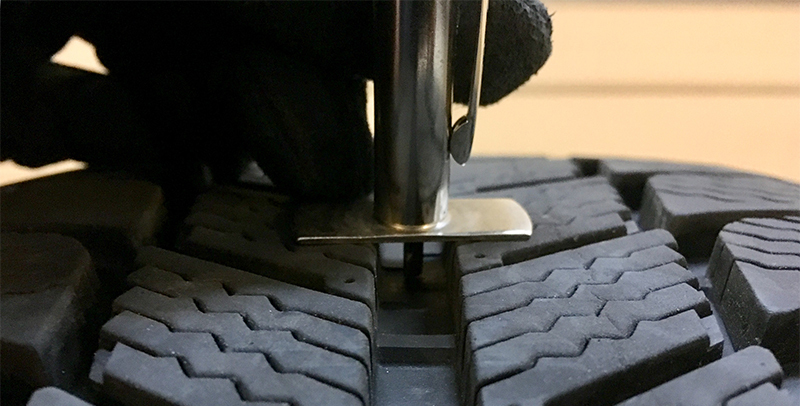 Push the extended "driver" end of the gauge into the tread groove, and keep pushing down until the handles of the gauge rest flat on the adjacent tread blocks. The measurement stick extends at the opposite/top end of the gauge according to the depth of the groove. Take multiple tread depth readings across each tire’s tread by inserting the gauge into all of the circumferential grooves. 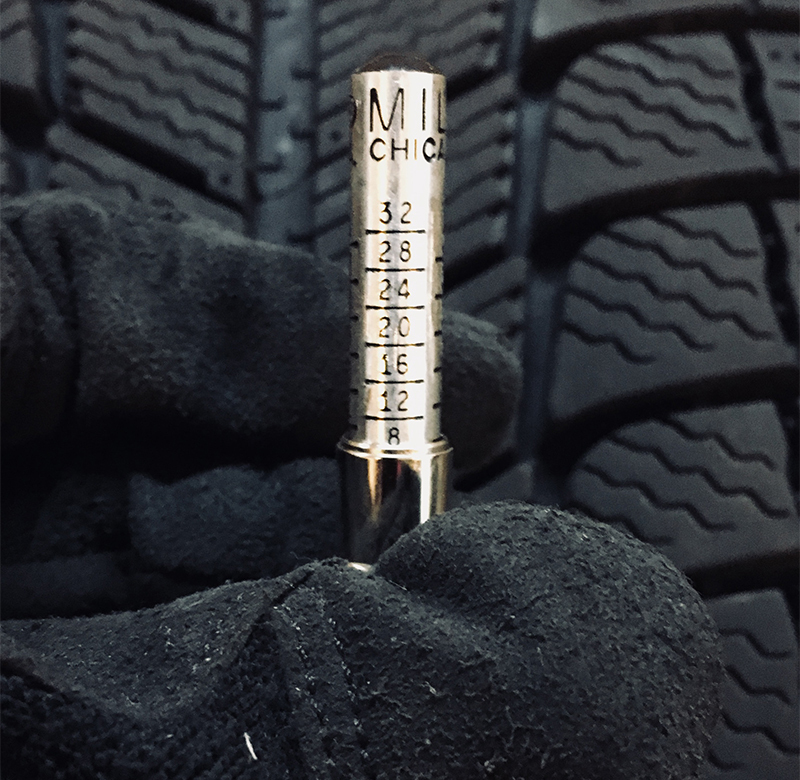 If you're not in a good position to observe the reading as the measurement is taken, (for example, if you're reaching into the wheel wells to measure mounted tires) be careful not to bump the gauge and disturb the reading as you remove it to take a look. If tread depth readings vary, which is the one to go by? To be safe, we recommend a “glass half-full” approach on that. If tires are worn unevenly, use the lowest reading. Minimum tread depth for car tires in the United States is 2/32". Each tire is equipped with "wear bars" in those circumferential grooves, which indicate 2/32". Under no circumstances should street tires be worn and used below minimum tread depth. However, note that even before minimum tread depth is reached, a worn tire's performance on roadways with standing precipitation, especially snow and ice, is lessened. So when is it time to buy new tires? You might be able to “get away with” extending the life on a set of summer performance tires in Phoenix, but that same set of tires should probably be ditched for Miami's rainy season. Though your all-season tires might do a reasonably good job in mild wintry conditions, you can’t expect them to deliver that wintertime performance all the way to minimum tread depth. And if you’re an all-terrain or mud-terrain tire user who spends time off-road, you'll definitely experience a drop in performance before you reach the minimum tread depth. So there’s no hard-and-fast rule as to when, and at what tread depth, to replace tires. 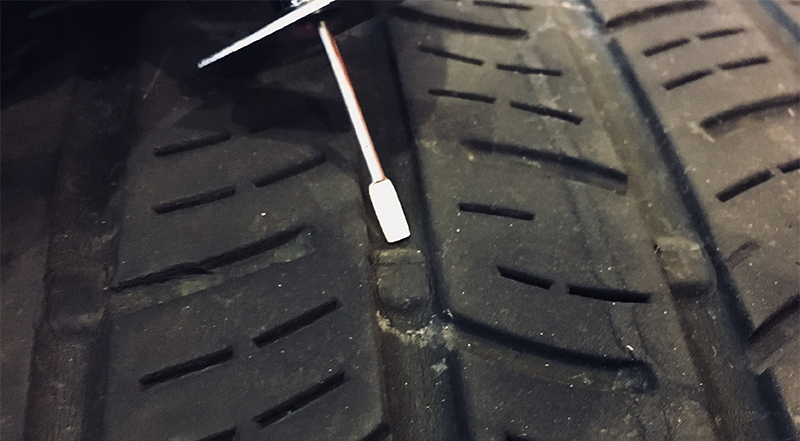 Once you have tire tread depth readings for your tires, contact a TireBuyer.com tire expert for help making the decision, in light of your driving circumstances. Last but not least, trust your driving instincts. Don't feel like your tires are offering the same level of grip they once did? Not sure if they're up for another winter, or an upcoming rainy season? Perceived loss of performance and traction is as good a reason as any to move on from a used set of tires. Don't let any tire tread depth readings convince you of the roadworthiness of a used set of tires if your driving instincts tell you otherwise. Some tire shops provide basic tire tread gauges free of charge. If that's not the case with your local shop, they might lend you one to take measurements on site, or have one of their techs take the measurements for you. Alternatively, tire tread gauges are available at large retail outlets like Walmart, Home Depot, and Amazon, or your local auto parts store for just a few dollars. A very worthwhile investment for increased tire awareness and greater driving safety. Tire pressure is kind of a big deal. Find out why, and learn how easy it is to keep your tires in shape with regular checks.